Making friends in Pokemon GO is easy, but understanding the intricate damage bonuses and trading discounts that come from levelling Friendship relationships is not. 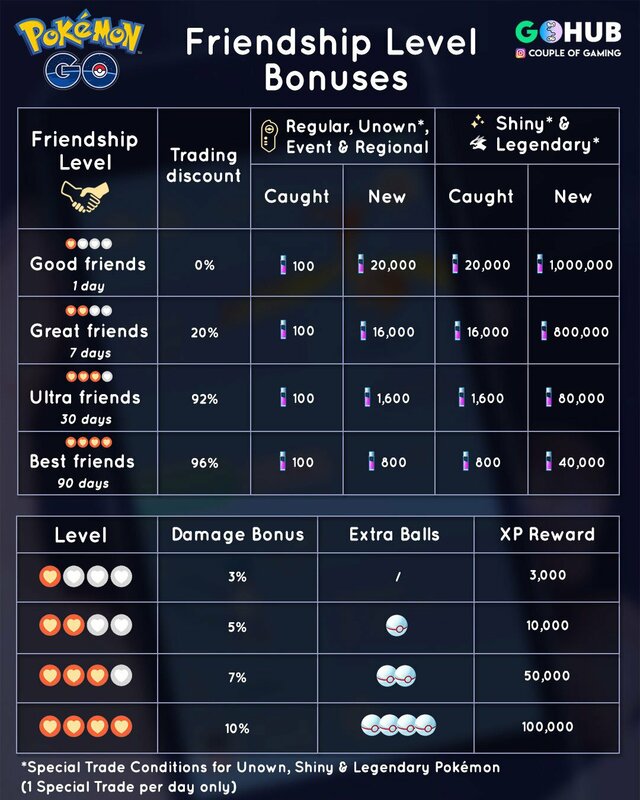 Luckily, we have prepared a few table to help you make sense of Pokemon GO Friendship level bonuses. Don’t slack until you reach Ultra Friend status with the people you play with. A month from now, paying 8 Stardust for a trade will become expected for everyone who was invested in the system. Try not to fall behind. Remember that you can increase your Friendship level only once per day, which means that once per day you have to remember to gift or to do a raid. It’s super easy to stay up to date, so make sure to do this every day. The post Friendship Level Bonuses in Pokémon GO appeared first on Pokemon GO Hub.